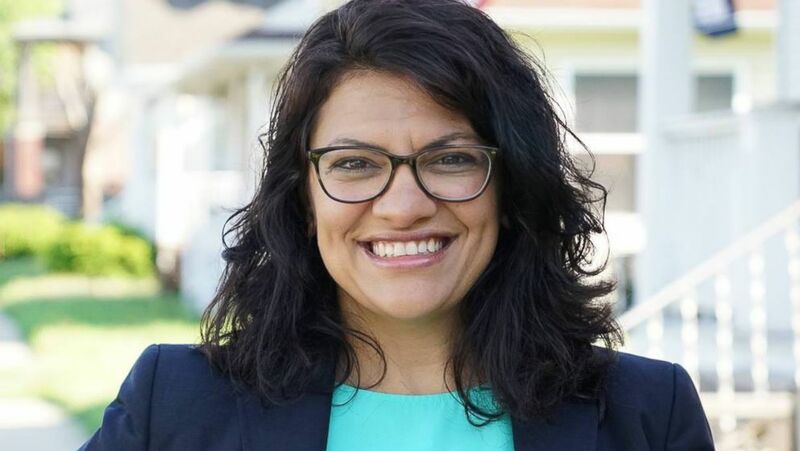 Rashida Tlaib was sworn in as a congresswoman on Thursday. Tlaib, who was sworn in as Michigan's representative from the 13th Congressional District on Thursday, was speaking at an event for progressive advocacy group MoveOn.org when she relayed a conversation with her son to the crowd: "And when your son looks at you and says, 'Momma, look you won, bullies don’t win,' and I said, 'Baby they don't,' because we’re gonna go in and impeach the motherf-----." After the comments drew fire, especially from conservative quarters, Tlaib tweeted Friday morning, "I will always speak truth to power. 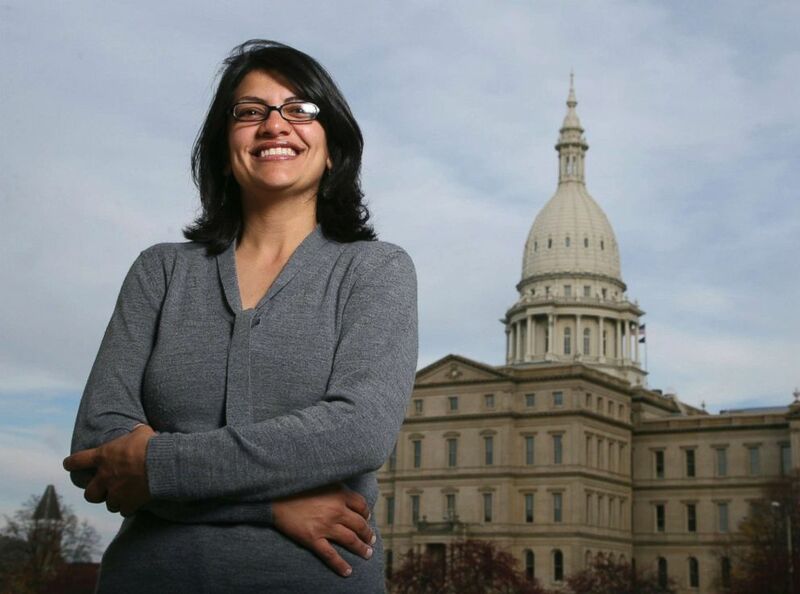 #unapologeticallyMe"
(Al Goldis/AP, FILE) Rashida Tlaib, a Democrat, is photographed outside the Michigan Capitol in Lansing, Mich., Nov. 6, 2008. Although he didn't mention her specific comment, Trump tweeted Friday morning that Democrats "only want to impeach me because they know they can't win in 2020." The 20-second clip of Tlaib's profane declaration, which was shared on Twitter by Nestor Ruiz, a digital organizer for immigrant advocacy group United We Dream, quickly made the rounds Thursday night. Several journalists in attendance at the event also confirmed she made the comment. The call for impeachment earned raucous applause, according to the video. ABC News has reached out to MoveOn.org for comment. Tlaib, a mother of two, has called for the president's impeachment in more-restrained language previously, including in an op-ed for the Detroit Free Press on Thursday. "President Donald Trump is a direct and serious threat to our country. On an almost daily basis, he attacks our Constitution, our democracy, the rule of law and the people who are in this country," she wrote, in an op-ed with a byline shared by John Bonifaz, co-founder of Free Speech for People. "Each passing day brings more pain for the people most directly hurt by this president, and these are days we simply cannot get back. The time for impeachment proceedings is now," the column concludes. (Rashida Tlaib For Congress/Facebook) Rashida Tlaib is pictured in this undated Facebook profile photo. The organization Free Speech for People has routinely pushed to start proceedings to impeach Trump. New House Speaker Nancy Pelosi has been hesitant to talk impeachment in relation to the president. In an interview on NBC's "Today," hours before being named speaker, she hedged and said she preferred to wait until special counsel Robert Mueller wraps his investigation into Russian meddling in the 2016 election -- a delay Tlaib specifically said was unnecessary. "We have to wait and see what happens with the Mueller report," Pelosi told "Today" on Thursday morning. "We shouldn't be impeaching for a political reason, and we shouldn't avoid impeachment for a political reason. So we'll just have to see how it comes." (Alexandria Ocasio-Cortez/Instagram) Ilhan Omar, Ayanna Pressley, Rashida Tlaib, and Alexandria Ocasio-Cortez sit at a table together at new House member orientation, Nov. 13, 2018. The 42-year-old Tlaib has garnered attention as being part of a new crop of progressive lawmakers pushing the Democratic Party further left. Tlaib and Rep. Ilhan Omar, D-Minn., both sworn in Thursday, are the first two Muslim-American congresswomen in history. 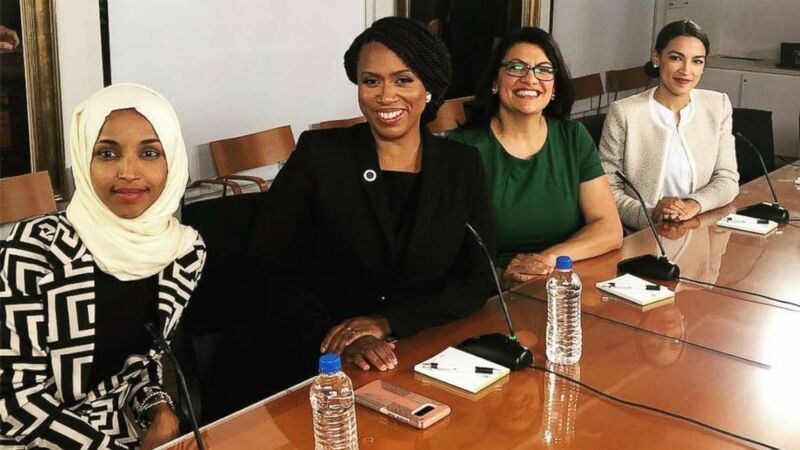 Tlaib and Omar have regularly joined with Reps. Ayanna Pressley, D-Mass., Alexandria Ocasio-Cortez, D-N.Y., Sharice Davids, D-Kan., and Deb Haaland, D-N.M., as minority women newly elected to the 116th Congress. Pressley is the first-ever black congresswoman from Massachusetts, Ocasio-Cortez is the youngest woman ever elected at 29, and Davids and Haaland are the first two Native American women elected to Congress.